Only days after my sister had sent me a birthday package with (can you believe it!) a cookbook in it, did she confess that there should have been two, but she started to read one of them – and what cookbook giver hasn’t done that? – and got so interested she kept it. I had to know what that cookbook could be: It was “How to Cheat on Your Man (in the Kitchen)." The sneaky premise the author, Missy Chase Lapine (aka The Sneaky Chef), proposes to us is that you can surreptitiously slide healthy vittles into vegetable loathing husbands and significant others while they’re not looking and they’ll never know they’re eating healthily. By making purees of cauliflower, garbanzo beans, carrots, spinach, broccoli and the like, you can create a veritable palette of brightly colored vegetable paints and by merely adding them to the traditionally manly favorites – of, let’s say, meatballs (green puree), spaghetti sauce (orange puree), or potatoes (you guessed it - white puree), you can get a pile of nutrients into unsuspecting victims! Now my husband is really a pretty good vegetable eater. He gets broccoli and cauliflower mixed up now and then and he does think starchy corn is a great vegetable. But if there’s a way we can get our five-a-day in more easily, I’m curious. All this is a roundabout way of telling you how I decided to make baked egg rolls. I didn’t add any colored puree to the egg roll filling; I was just inspired by the cookbook discussion with my sister to look for ways to eat a little better. I generally like the real thing in its original form, but I’m open to learning new ways of doing things. 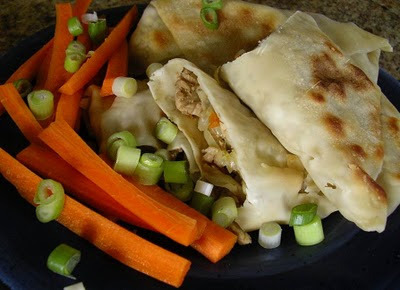 I wanted to find a way to cut back on the fat and the calories of one of my favorite fatty foods – egg rolls. I make them at home fairly often, but any deep frying is messy and it always leaves a lingering odor (or is it fragrance?) How would egg rolls be baked, I wondered. So I scoured my own cookbook library, searched the internet and headed to the kitchen. I found a recipe from Emeril I liked, but he asked for Napa cabbage or bok choy, which would have been great, and I just had regular ol’ cabbage. And several other sources also referred to a Cooking Light version so, relying on safety in numbers, that’s what I did. The only things I did differently were to use roast pork I had on hand and I just used water to seal the egg rolls. Instead of the soy-based sauce, I’ll use mustard next time. I’ll brush with canola oil instead of using vegetable spray. I’ll thicken the filling with cornstarch and soy sauce. I may be adding a few more calories and fat but since my only complaint was that they were a tad dry, that’s a compromise I can live with. Preheat oven to 425°. Combine celery and carrot in food processor, and pulse 10 times or until finely chopped.Combine celery mixture and cabbage in a medium bowl. Cover with plastic wrap; vent. Microwave at high 5 minutes; drain. Heat vegetable oil in a large nonstick skillet over medium-high heat. Add onion, 1/2 teaspoon ginger, and garlic; sauté 2 minutes. Add turkey; cook 5 minutes. Remove from heat; stir in cabbage mixture, 1 1/2 tablespoons soy sauce, and pepper. Cover and chill 15 minutes. Place 1 egg roll wrapper at a time onto work surface with 1 corner pointing toward you (wrapper should look like a diamond). Spoon 3 tablespoons turkey filling into center of wrapper. Fold lower corner of egg roll wrapper over filling. Fold in corners Moisten top corner of wrapper with egg white; roll up jelly-roll fashion. Repeat procedure with remaining wrappers, turkey filling, and egg white. Lightly coat egg rolls with cooking spray, and place, seam side down, on a baking sheet coated with cooking spray. Bake at 425° for 18 minutes or until golden brown. To prepare sauce, combine 3/4 cup soy sauce, vinegar, sesame oil, and 1 tablespoon ginger; serve with egg rolls. Garnish with green onions, if desired. Will have to try these again. I think I did a few things wrong. But worth trying a 2nd time around. These look and sound really good. Thank you so much for sharing the recipe! I completely agree about the lingering friend smell...and the mess! These sound like a great improvement. Ina’s Coconut Cake Topped the Birthday Surprise!